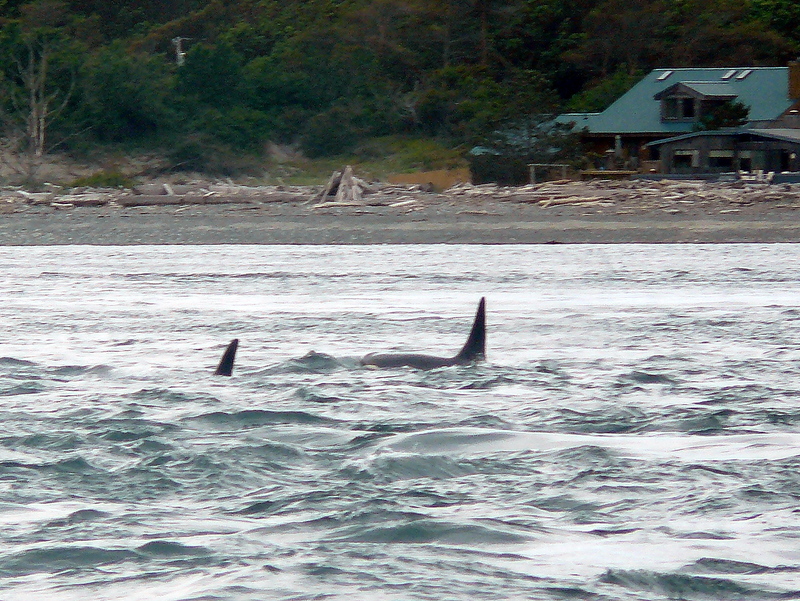 Today reminded me of Sunday, with J-Pod heading from Whidbey Island toward the south end of Lopez, about 1:15pm. Amazing to watch them swim fast and like the dolphins they are, with the full moon strong flooding tide. (Remember the terms whale, dolphin, porpoise, are common names. Even the names like Killer Whale, Right Whale, etc. are common names. Orca is part of the scientific name. Ask, do they have teeth or baleen? There are the real differences. All porpoise and dolphins have teeth, so think of them as toothed whales!) We watched J-Pod with L-53 Lulu and L-87 Onyx, spread out in 4 groups, with J-2 Granny in the lead again! Looked like newest calf J-47 in the next group. Interesting that J-26 Mike and J-27 Blackberry were in the last group again, with L-53, and the NOAA vessel following, trying to deploy the suction attached short term D-tags. Again, this last group of Orcas dipped into Cattle Pass slowed down, showing how strong they are against the huge currents, with tail fluke slaps, a few breaches, and spy hops. A male also showed “pink floyd”, so mating with L-53 going on? As we headed up Cattle Pass at about 3pm, the whales increased their speed around Goose Island and Cattle Point to catch up with the rest of the clan off South Beach. 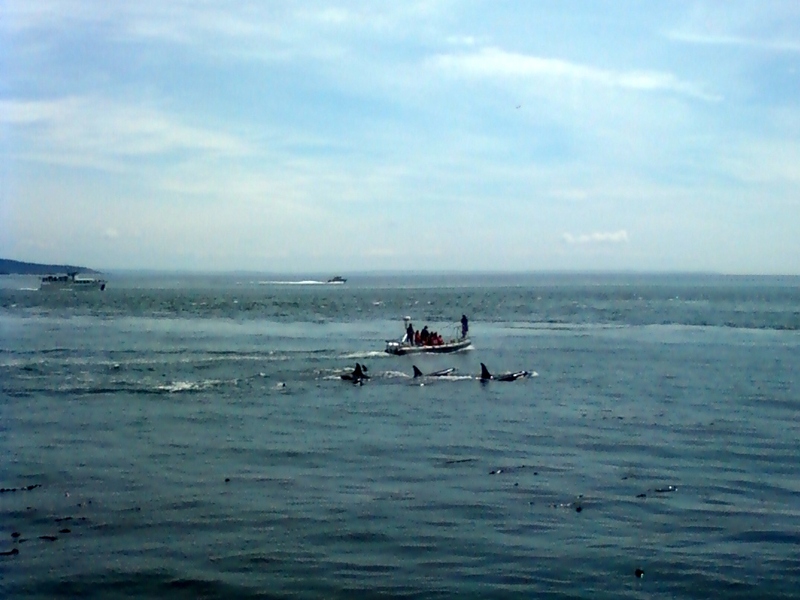 Off of Deadman Bay, in Haro Strait, a school group of kids, (and all the grown ups!) 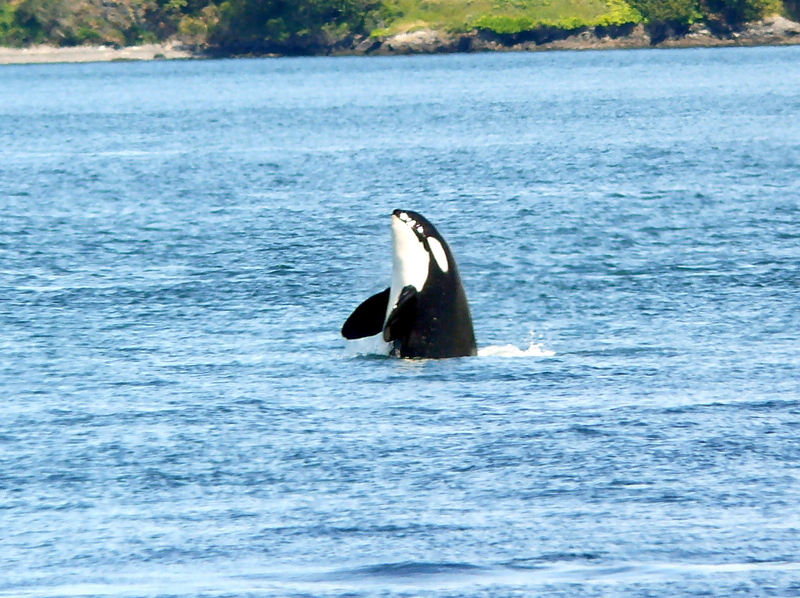 were thrilled to see J-Pod Orcas. Another strong flooding tide and the whales spread out in 4 active groups, with J-2 Granny in the lead. From about 1:45 to 3 pm, as they headed north, the Orcas also breached, spy hoped, tail fluke slapped the surface, and some made direction changes as though fishing. J-27 Blackberry and J-26 Mike were together. 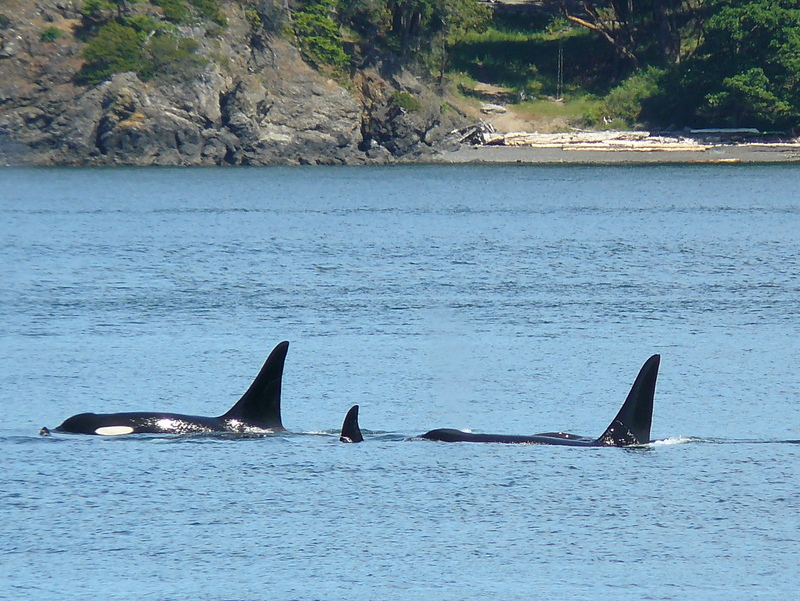 They are now the eldest males in J-Pod, at 20 years old. While hiking on a beautiful sunny day, around Cattle Point Lighthouse around 1 pm, surprise! Three tight groups of Orcas are heading past Lopez toward South Beach. The first 2 groups swam past pretty fast, but the 3rdgroup dipped into Cattle Pass. The NOAA research vessel, trying to deploy D-tags was right with them. We were able to identify J-27 Blackberry, J-34 DoubleStuf, J-16 Slick with youngster J-42 Echo. I thought they would probably head up Haro Strait with the flooding tide, and sure enough we saw them on the west side and traveling north past Lime Kiln Point State Park! Two hours of great views from San Juan Island! « Young Orcas Breaching Day!! !